Japan recorded its highest temperature ever July 23 as the mercury hit 41.1 in Kumagaya, Saitama Prefecture, amid a deadly heat wave, the Meteorological Agency said. Scorching weather killed 77 people and sent more than 30,000 to hospitals across the nation from July 9 to July 22, according to the Fire and Disaster Management Agency and a Kyodo News tally. At least nine people died July 23. The heat wave also set a new record in Tokyo, where a sizzling temperature of 40.8 degrees was logged in Ome, the agency said. 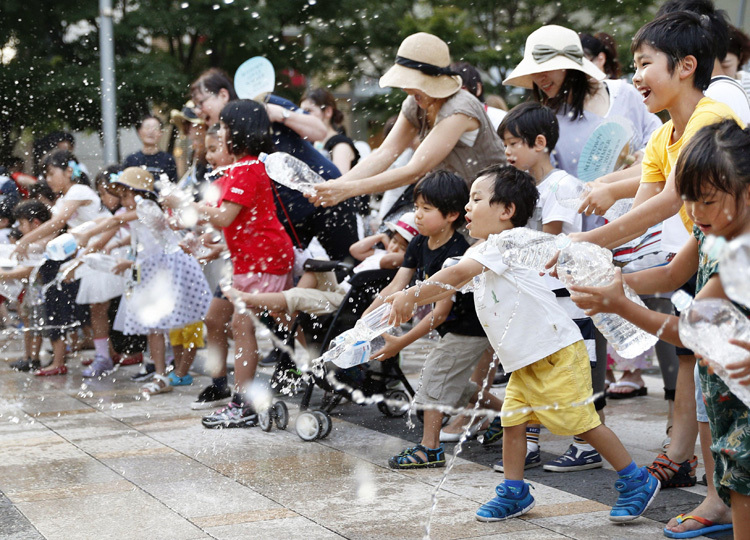 The record-setting heat wave comes just two years before Tokyo hosts the Olympics. The temperature in Kumagaya hit 41.1 degrees at 2:16 p.m., eclipsing the previous record of 41.0 set in August 2013 in Shimanto, Kochi Prefecture. The temperature also hovered near a record high in Tajimi, Gifu Prefecture, which saw the mercury touch 40.5 on July 23 after hitting 40.7 on July 18, the agency said.